This exceptional 330 sqm property is located in the capital's prestigious 16th District. 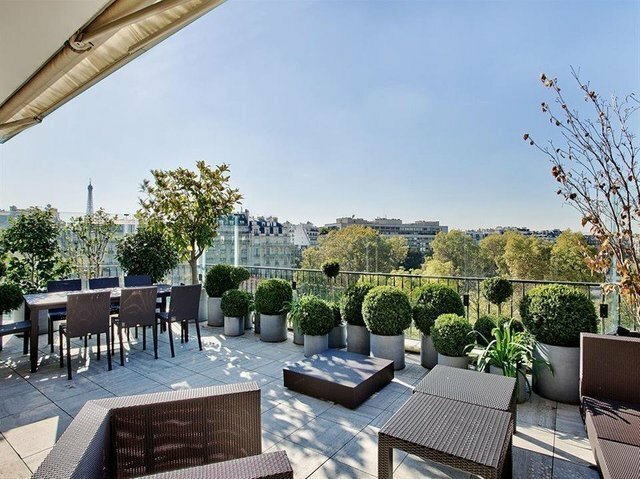 South-facing and enjoying a view of the Eiffel Tower, it includes a magnificent reception room opening onto the terrace and featuring superb 18th century paneling and exquisite parquet flooring. Air-conditioned and in mint condition, the property also comprises 5 bedrooms and 4 bathrooms. With 2 parking spaces, a 15 sqm studio apartment and a 30 sqm cellar. Optimal security.